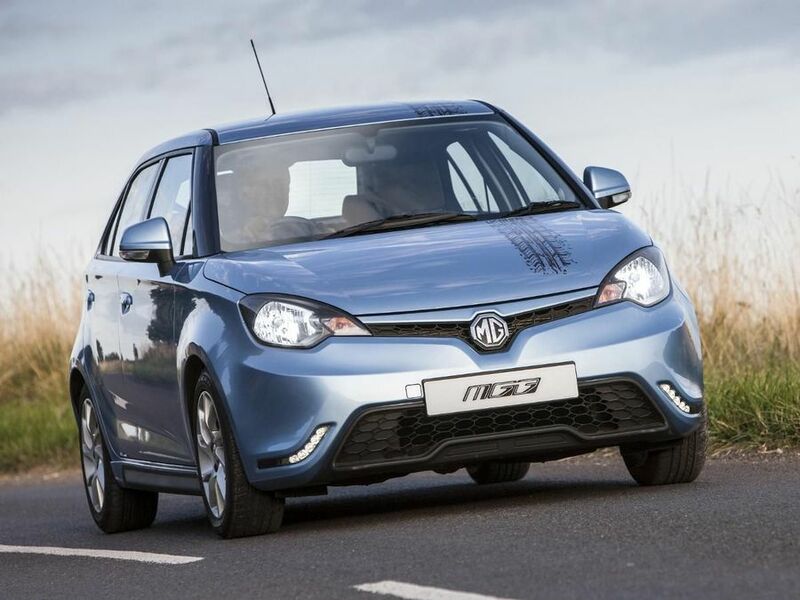 The MG3 has individuality, practicality, price and agility on its side, plus it comes with plenty of safety kit. However, the poor ride and refinement count against, as does the cheap-feeling interior. Not bad, but we’d look elsewhere. Interested in buying a MG MG3? MG sees itself as a traditionally sporty brand and the 3 matches up to that image. The angular headlamps, split-level grille and LED running lights give the front some edge, while the vertical light clusters and the rear spoiler (standard on all but the entry-level car) lend some raciness to the rear end. The bit between the two extremities looks a little bulbous, due to the high roofline, and only half the range gets alloy wheels. Overall, though, this is a smart-looking little car. And, like with many other small cars, there are a whole host of affordable ways in which to personalise your car, including decals, mirror graphics and a large palette of paint colours. The MG3’s cabin is a mixture of positives and negatives. On the plus side, the all-round visibility is pretty good and the simple dash layout means that most of the controls for various functions are easy to find and use. However, the stereo buttons are the exception, because they’re small and fiddly: and while there’s plenty of height adjustment for the driver’s seat (on all except the entry-level model), the steering wheel has no reach adjustment, only height. That means some drivers could struggle to get comfy. The biggest problem with the cabin, though, is the quality: the vast majority of the surfaces are made out of hard, scratchy plastics that look as drab as they feel, and some panels feel decidedly flimsy and lightweight. The MG3’s high roof means that there’s plenty of headroom in any of the seats, with the rear seats also having enough legroom to let tall adults sit comfortably. That’s not something you can say about a lot of rival superminis. The boot is a decent size by supermini standards, and it’s a usefully square shape, too. The 60/40 split rear seats fold down to give you extra luggage capacity, but you’re left with a load area that’s both stepped and sloped. If you’re after comfort from your supermini, then the MG3 isn’t for you. The firm low-speed ride means you’ll be jostled around in your seat in town, while on the motorway, expansion joints and small bumps give the 3 an even worse case of the jitters. That said, the MG is actually quite good fun in its own way: body control is decent and grip is fairly strong, making the car feel quite pointy in bends. And, while the steering doesn’t have much feel, it’s pretty direct. Only one engine is available in the MG3, a 1.5-litre petrol with 104bhp. It feels fairly sprightly when you work it hard, but it’s rather flat at the lower end of the rev range, meaning you’ll need to stay busy with the five-speed manual gearbox to keep it on the boil. The engine is also slow to build revs, which makes your acceleration feel even more laboured. The sound of the engine is a bigger problem, though: it’s very noisy when you’re building speed and it transmits too many vibrations into the cabin. It also buzzes away irritatingly at motorway speeds and road noise is also rather too prevalent. This is another area in which the 1.5-litre engine causes problems. The official fuel economy figure is given at 48.7mpg, while CO2 emissions are 136g/km, which are pretty poor figures by supermini standards. Resale values will also be pretty weak, which will elevate your whole-life costs. That said, insurance groupings are reasonably low and the MG3 is a cheap car to buy. Look at Warranty Direct’s Reliability Index and you may get very worried about the reliability of your car. MG languishes at the bottom end of the manufacturer’s standings and some of the brand’s models – such as the MG TF – are rated pretty much as badly as you can get. However, these performances are based on very old MG models and the brand has changed hands since then. Unfortunately, there’s very little data to suggest how the newer ones will fare. The MG3 may be a cheap car, but it doesn’t scrimp on safety kit. Six airbags are provided as standard, along with stability control, hill-hold control (to stop you rolling back during hillstarts) and a tyre-pressure monitoring system. When the car was crash-tested by Euro NCAP, it received just a three-star rating, less than many other superminis. The range kicks off with 3Time trim, which only provides the basics: four powered windows and a CD stereo with USB socket, and that’s about it. It doesn’t cost much to upgrade to 3Form trim, which earns you remote locking, air-con, electrically adjustable door mirrors, a leather steering wheel with audio controls, two more speakers and a DAB radio. 3Form Sport trim adds alloys and body-coloured side sills, while the 3Style range-topper has parking sensors, cruise control and automatic lights and wipers. The MG3 will appeal if you have a desire to be different, especially if you have a limited budget to work with. It’s practical and quite good fun, too, but it struggles in too many other areas to be a serious contender in the supermini class.